Distribution: Subtropical and warm-temperate rainforests of New South Wales and Queensland. Derivation of Name: Syzygium...from Greek syzygos, joined, referring to paired leaves and branchlets of a Jamacian species. Syzygium is a genus of about 500 species occurring in tropical and subtropical rainforests. There are about 50 species in Australia occurring in the Kimberly region of Western Australia, the Northern Territory, Queensland and northern New South Wales. There has been considerable botanical revision of this and the related genera Acmena and Eugenia. 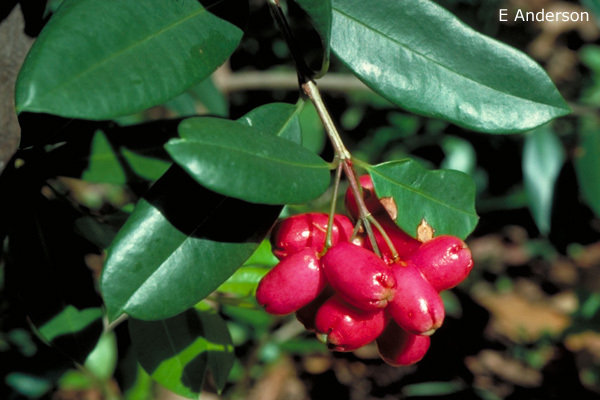 The species formerly known as Eugenia australis is now regarded as two separate species, Syzygium australe and S.paniculatum. Syzygium australe is a common plant of coastal and highland rainforests from southern New South Wales to central Queensland. In nature it can reach over 25 metres in height but is usually smaller in cultivation. The leaves are opposite (each pair emerges from the stem at the same location but on opposing sides), rounded and bright, glossy green in colour. White flowers are followed by large, fleshy, red fruits in profusion. These are ovoid in shape and around 20 mm long with a large seed. The fruits are edible and are often made into jams. They can also be eaten fresh and have a crisp, refreshing texture. S.australe is a hardy tree in most temperate and subtropical climates and is cultivated in most Australian states. It prefers rich soils and assured moisture. At least two compact forms have been marketed in recent years. These probably grow to no more than 2 metres and may be found under the names "Blaze" and "Tiny Trev". The compact forms should be suitable for growing in large containers. Propagation of S.australe is usually carried out from fresh seed, either by sowing the fruits whole or after removing the flesh. Germination may be slow and spasmodic. The species can also be grown from cuttings of firm, current season's growth.